I had some really good casters yesterday who made me look good with the albies under tough conditions. We hooked 10 on the fly, landed 6. Also saw a couple schools of puppy drum in the suds. Plan on playing with them a little more today. "I fished guide Mike Smith and Martin Bawden of Flymen Fishing CO. For 2 days in less than ideal conditions...winds 15 to 30 knots. Even with the breeze, the boys landed stripers, specks, redfish and flounder on the fly rod...sweet!" 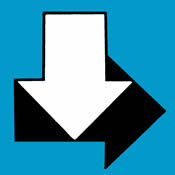 HOT: Capt. Joe Ward's bite in the Neuse yesterday. NOT: My day on a very blustery ocean yesterday. Our stellar catch of bluefish, pinfish and lizardfish....oh, 1 sub legal trout.... was not photographically documented. Good news is that there was a pretty good sign of albies....they just weren't very cooperative. Capt. Joe Ward with one of the decent trout that made up his limit the other day.....the trout bite didn't last long, but a good striper bite on the jig kept things busy. On the way back in town we stopped by to see our friends John Boy and Billy. Hope that you heard us on the radio!! After the show, Johny took us to the farm and put us up in the hayloft of the barn, but that worked out OK, we had our bellies full of cheesburger pie. Good stuff. Back in town now.....just in time for the wind to blow, but this northerly breeze will cool off the water and fire off the fishing.....like it's not hot already! Capt. 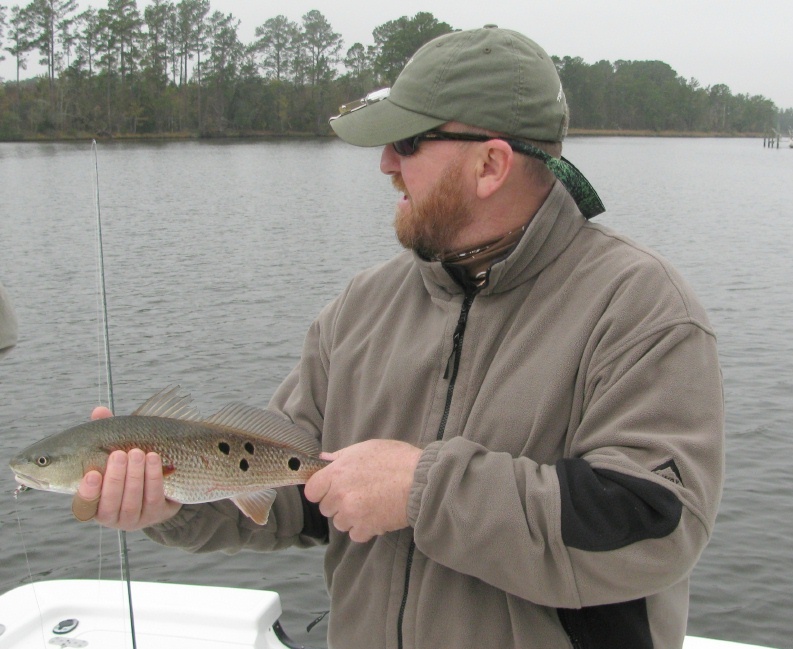 Joe Ward reported a great day with the specks yesterday and Capt. 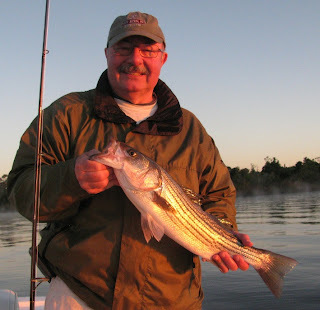 Gary is still working on those striped bass up the Neuse. Albies scattered up and down the beach and still a few schools of those big drum on the east side of Cape Lookout. That's what it was about last night in downtown Nashville. Very cool place. 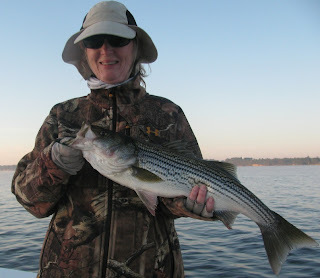 "Smoking HOT striper bite at New Bern today...3 anglers, 1/2 day fishing, 75 fish on top water and DOA jigs(clients kept the body count)....look out Weldon! It don't get much better than this!" Although we're on the road, we're still working. Great time last night at the Grand Old Opry. I know it's a long ways off, but when you want to go to the best places in the world at the best times for hunting and fishing, you better book in advance. 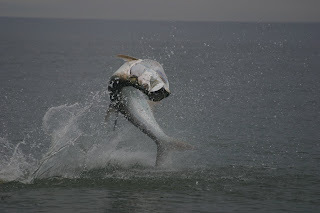 The tarpon: Silver King Lodge is already 80% booked for next October. I have set dates for our fall trip to the lodge, scheduled for Oct. 22, 23, 24, 2012. If you want in, call or e mail me NOW to reserve your spot. They will be 100% booked soon. The ducks: I have reserved July 7-15, 2012 to host a duck and/or dove hunt for two groups. Details are coming together, call or e mail me NOW if you want to be on the ground floor of planning your perfect trip.
" Yesterday we caught 5 wahoo, a triple header sailfish and 2 mahi. Today we caught 12 wahoo, 2, mahi, a king mackeral and 2 sailfish. Gotta love fall fishing!" I guess this is a travel blog also.....Anna and I took the weekend to head to the mountains, but not our usual trip to Virginia. This time we checked out NC, staying the night in Asheville and visiting the Biltmore Estate. Actually, I was pleasantly surprised, just would have liked to have harrassed the giant bream in The Bass Pond with a fly rod. Despite one of the busiest weekends, with over 5000 people there today, things were not crowded and it was an enjoyable experience. The Embers were playing last night and we toured The House and Gardens today. We both have become wine snobs, actually, she's the snob and I just drank what she doesn't like. We had to do a lot of "tastings" . Also, I was impressed with the food, not the kind of amusement park junk that you would expect, but really, really good food in all the restaurants and everything was very reasonablly priced. If you want a weekend getaway, I'd recommend it. "Fished New Bern today....landed over 30 stripers and a nice trout. A few top water bites, but water was low and wind was blowing. A few on rattle traps, then the wind fell out and we crushed them on jigs and left them biting. Sent the boys home with limit of rock and that nice speck." For us, it's off to Nashville today, Grand Ol Opry tonight and making it back home next week just in time for the next blow. I imagine that Capt. Brian Horsley and company are whacking the albies......and the big drum. Yep, there has been a pretty consistent big drum bite on the East Side, when the weather is right, they've been pretty easy to find, all sight casting. I look forward to some of that next week. The albie bite has been really good this year and from this pic from Capt. Joe Shute, the big 'uns have showed up. With the approaching blow, I opted to follow up on that striper bite up the Neuse and I was not disappointed. We caught stripers everywhere we stopped. Great day on the water yesterday with Capt. 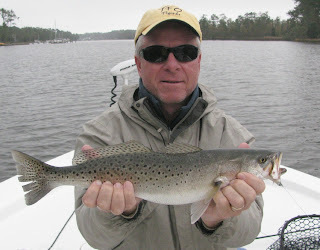 Joe Ward, lots of nice trout and enough flounder and pups for three inshore grand slams. Does the rain follow me around? First week in Costa Rica was fantastic, then a little wet.....Miami for the weekend.....very wet.....just got back to NC and a rash of calls regarding cancelling charters this week due to the semi-tropical forecast starting Tuesday.......I think that I'll be chasing stripers up the river out of the wind. According to Capt. Gary, that's been pretty good. I'm getting dates and details together for next year's Argentina trip. If this is the year that you want to go, come on and go with me. We're looking at late June/early July. If you have a serious interest, drop me a note and let's narrow down some dates that work with your schedule. Got a note from my outfitter down there that they have space for 2 dove hunters to join another group and come down Dec. 19-22 for a discounted dove hunt. The weather has broken here in Costa Rica, it's beautiful today, unfortunately I'm on the way to San Jose on business, heading back to the states for the weekend and back out on the water in NC next week. Beautiful weather last week down here in CR, here's another pic courtesy of Dr. Bryan: but it's been a wet few days here on the Pacific side of Costa Rica. I hear the same thing is going on up in NC, but according to Capt. 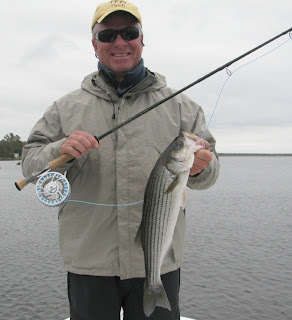 Gary, the decent top water bite for stripers has improved with the overcast conditions, also some 16-20 inch specks in the creeks and a few pups and flounder. Pretty impressive fishing by Jim "Never Enough" and Henry Frazer. In 6 days of fishing on two different boats, they totalled over 100 tarpon releases......and these weren't little ones. Lee Smith fished 8 days and landed over 30 on the fly. Got a note from Capt. Brian Harrington on the Run Off that he is open this Saturday if anyone wants to get into the wahoo action. "My second return from VA this Summer. Both fish tagged in Oriental this spring. Tag return from VA on Sept 30th was recaptured from the Piankatank River in VA. It was caught yesterday by a VA guide. Fish was 23.5". In the same spot the day before he caught another fish that was tagged by Ricky Kellum in February in the New River up near Jacksonville. 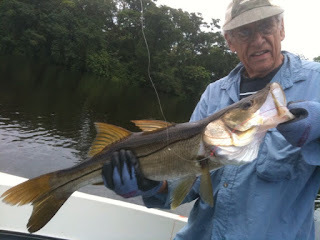 Pretty neat that two fish tagged in different parts of NC at different times ended up being caught at the same time and same spot in VA."
Here is a pic of one of several snook from one of the Lee and Richard, who were also at the lodge we were tarpon fishing, but they stayed in the jungle and chased snook on the fly. 10 minutes to get the bite, less than 10 to put this one on her side. "Daily limits of wahoo, scattered mahi, blackfins and sailfish. of 14 and 16 wahoo a day have been the average. B." We started the morning off with a family of scarlet macaws outside our window, fresh cinamon rolls from the bakery, then off to the Dragin Fly. About an hour run straight to several square miles of scattered dophins (the Flipper kind), birds and busting tunas. It didn't take long to get a bite, actually 4 bites, on cedar plugs and casting poppers. 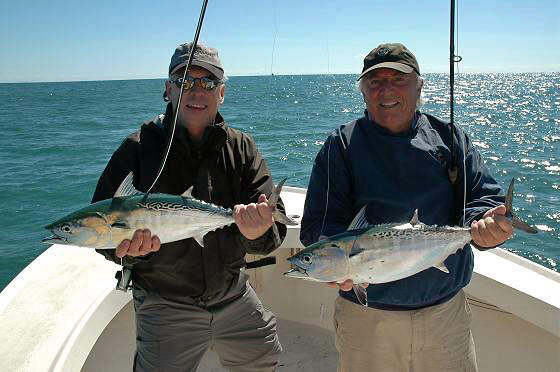 On two different occasions we were hooked up with quadruple headers on tuna, landing all 4. With a dozen tuna in the box, it was time for Anna to get in the water and swim with the dolphins....she got the underwater view of tunas crashing my popper. We finally coaxed her out of the water when the boat beside us hooked up with a sail. We put the billfish spread out, but continued to have tunas eat our ballyhoo. 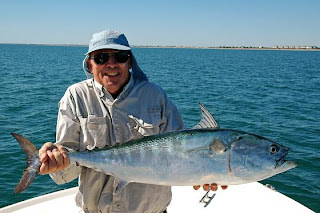 "just wanted to drop a line to those of you that like to catch false albacore. The bite has started early. The small albacore have been around for the last few weeks, but some of the larger albies are starting to show up. Yesterday the fly fishing for the albies was just about as good as it gets. The weather is cooling off and I really think that the rest of October is going to be pretty good fishing, whether you are fishing with a fly rod or conventional spinning tackle. 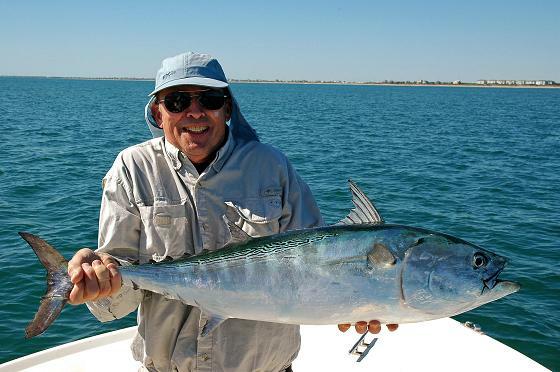 The jack fishing is wide open as well if you really want to get into some heavy duty fishing." They caught 11 for 17 sails today in Costa Rica and got the tunas big time. Lots of tarpon at the river mouth.